For example, I get nurturing emails from companies that know me — in some cases, I’m their customer — but their emails don’t show it. Here’s the kicker. Each irrelevant message they send anchors me to ignore, delete or emotionally unsubscribe from future messages from that sender. That’s why I’m going to share seven tips you can use boost your email lead nurturing results immediately. Have you ever thought it’s funny when we put on our marketing and sales hats or walk into our offices how we can talk and write differently? Humanize your emails, build a connection, and continually offer value. It’s amazing the difference doing this can make. Also, check the tone of your email messages. Do you use a sales tone or an empathetic tone? For example, the following an A/B test from MarketingExperiments of a lead nurturing email that was sent to prospects who began a form completion but did not complete it. Note the difference in tone. The email on the left was “sales speak.” The tone of the email on the right was changed to be more empathetic and yielded a conversion rate of 7% versus 1.5% for the control email. By addressing the customer’s anxiety (with empathy) through the tone of the email, they saw a 349% increase in total lead inquiries. Sadly, many marketers don’t get to talk directly with the people they are sending nurturing emails too. Often, it’s inside sales, customer service agents or sales people who are talking with potential customers live and/or in person. In sum, treat people the way they want to be treated (not the way you want to be treated). You might be wondering: why alter “do unto others as you would have them do unto you”? Let me explain. If we do marketing and lead nurturing the way we want, it may not matter to the person we hope to positively influence with our help. Again it’s about them, not us. Marketing (i.e. lead nurturing) isn’t something you do to people. It’s something you do for people. The goal of lead nurturing is to maintain a relevant and consistent dialog with viable future customers, no matter where they are in the buying pipeline. It’s about relationships. Be sure to provide different kinds of information to your prospect based on what point they are in the customer buying journey. I found it’s helpful to notice that all customer buying cycles fit into three distinct funnel stages. Middle of the Funnel (MOFU): At this stage, people took some conversion step to express interest (subscribe, register, or download, etc.). You need to learn if this person and/or their company is a fit and their level of qualification. You also want to learn about their motivation. During this stage, you’ll share content to help progress them from interest towards purchase intent. Bottom of the Funnel (BOFU): People are moving through a series micro-yeses and decisions on their journey. At this stage, you’re moving them from being lead to a sales qualified opportunity. This is where the hand-off from marketing to sales takes place and where people ultimately make the buying decision. Tip 4: Use micro-segmenting for better relevancy. With marketing automation, you can use behavioral information. What content have your recipients read, links have they clicked, content downloaded, videos watched, events attended, etc. Personally, I use smart tagging on contacts with automated workflows in my marketing automation to do this. At first, I did this manually. Before you do this, I suggest you organize all your tags in a tagging schema. I use an Excel spreadsheet, so I don’t lose track and stay consistent. As you know more about your prospects role and the industry they’re in, you can then create messages based on industry vertical or company size. Industry information will most likely tell what pains your prospects are experiencing at an organizational level. At the same time, company size will give you a hint as to the resources they have available to tackle these challenges. Be sure to add this information to your marketing data often so that you can easily define your target segments based on these indicators. Read more on Email Nurturing: 3 lead nurture paths you should automate. Here’s a good lead nurturing litmus test: Can people get value from the information you provide even if they don’t buy from you? Effective lead nurturing starts with listening to customers to understand them, and then it requires identifying the key personas of your audience. What’s their job function? What part to they play in the buying process (influencer, decision maker, information gather)? For example, based on my experience, a decision maker is heavily involved at the very start and the very end of the B2B buying process but leaves the middle of the process up to the influencers. You’ll need to investigate who gets involved at which point in the buying process so that you can segment your messaging. What content do your contacts need? What are the problems they’re facing? Read more: Content Marketing: 4 stages to mapping your content strategy. In all my experience working with complex sales, I’ve not seen a someone take action or buy without a trigger event driving their motivation. 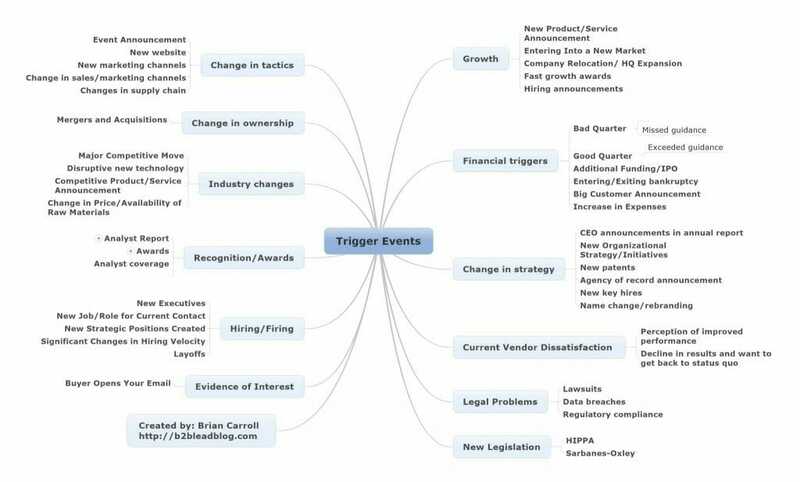 I define a trigger event happening associated with a consequence so significant that it causes new behaviors, ideas, and new sales opportunities. You will find specific trigger events that matter more to your audience than others because what you offer addresses different problems and emotional motivations. Trigger events matter for two key reasons. First, they can indicate that the status quo in an organization is changing, and second, they can contribute to the development of timely and relevant sales and marketing messaging. This is the hardest part to get right. Why? You do not just need to know how to test. You need to know what to test. Try email subject lines (this is my favorite relevancy booster — I find that the less marketing hype used, the better). Clarity matters. Personalize i.e. first name, company, specific interest, or pronouns you use. The response to your A/B tests will help you understand which message and approaches are most relevant and helpful and convert best with your audience. Personally, I’ve doubled my email marketing results and by A/B testing. Also, I’m getting more four times as many personal replies to my nurturing emails. Also, when you do lead nurturing tracks A/B testing is extremely useful because you can leverage what you’ve learned to reuse that optimized message again and again. If your email system or marketing automation doesn’t support A/B testing, start using one that does now. You won’t regret it. I shared seven tips you can use to improve your marketing and nurturing emails to boost relevancy, engagement, conversion and ultimately results. If you do one thing, do this: Put yourself in the shoes of the recipient of your email. If you get out of your head and imagine that you’re the potential customer receiving your message, you’ll get an immediate boost by asking: what are they thinking and what are they feeling? 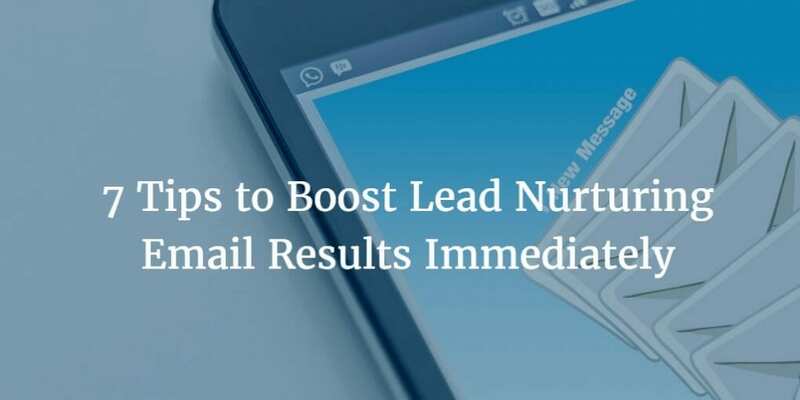 By doing following these tips, you’ll improve your lead nurturing emails to get better results. It’s your turn. What have you found works to create better lead nurturing emails?